The Christmas party season is coming up and I'm always struggling to decide what to wear that will be relatively warm, formal or party appropriate and comfortable but with the suitable glitz, detailing or lace for a christmas party or new year celebration. Thankfully there is still plenty of time to choose an outfit or two and Coast have so many gorgeous pieces! Coast isn't a store that I ever really shop at but browsing their site last week, I found so many gorgeous dresses that are lacy, flattering and christmas appropriate but minimal which is what I always go for. Also there are gorgeous bags and glitter and sequin covered pieces that would be perfect for the upcoming festive season. I adore the clutch bag, especially the design and glitter covered exterior; I'm not usually a fan of clutch bags but it's gorgeous and it does come with a chain strap *I have added it to my very long wish list*. Also I never really like jumpsuits but I love the simplicity of this one and the lace detailing makes it so gorgeous and festive party ready! This is a sponsored post. What do you think of the items I've featured? What will you be wearing to christmas parties this year? Do you shop at Coast? That jumpsuit is absolutely gorgeous! I really wanted a black jumpsuit that still offers something special for a while now & I think it´d be perfect for any Christmas party! I really like the clutch and jumpsuit, great selections! 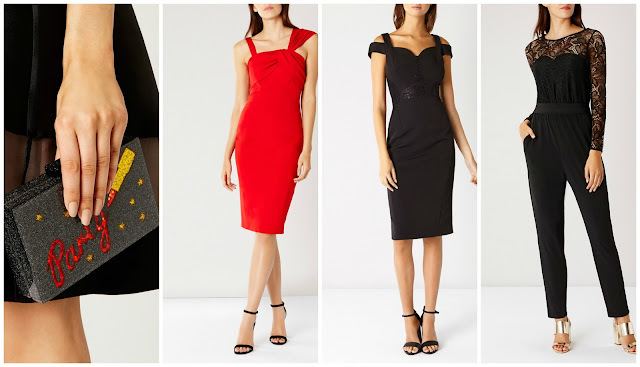 I'm so with you- it can be impossible to find the perfect holiday party dress! I love the jumpsuit! Oh my gosh I'm loving that red shift dress! It's such a pretty colour.